Collections MAX Scheduler is a free status based automation component. 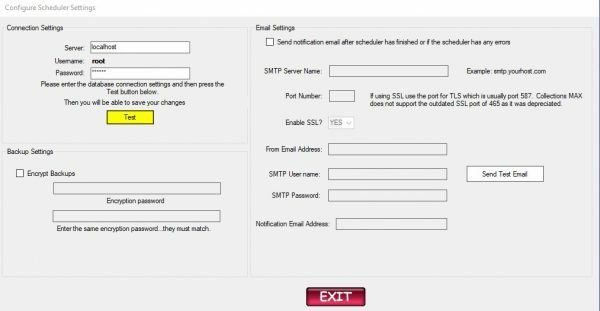 This software is usually installed directly on the server itself and can be fired by any type of Windows Task Scheduler at night so your accounts will have automated rules applied to them for work the next day. 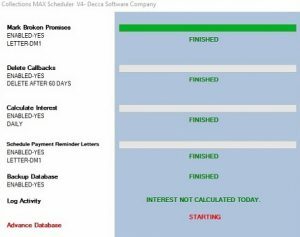 Collections MAX Scheduler is the automation component of the Collections MAX Debt Collection System. You can set it up so that it fires by itself at night using any Windows based task scheduler . Here is a list of features for Collections MAX Scheduler. Runs all of your automation rules that are setup in Collections MAX Administrator. Mark broken promises. Schedule broken promises letters if needed. Can clear up the callback que and delete old callbacks to keep it running smoothly. Calculate interest on accounts daily, weekly or monthly depending on the settings made in Collections MAX Administrator. Backup the database with or without encryption. Notify you via email after it has ran and will report any errors if any are found.